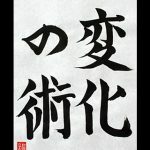 I wrote “Henge-no-Jutsu”. It means “The Atr of Change” in English. 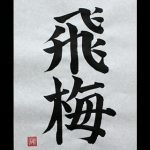 “Hen” means change “Ge” means -‘ize “No” means of, -’s, and so on “Jutsu” means means art or technique Henge-n-Jutsu is one of the famous ninjutsu. Naruto Uzumaki use Henge-n-Jutsu and transform to glamour girl in NARUTO. What is your favorite word in “NARUTO”? Please let me know your favorite word.